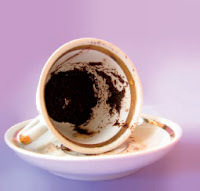 Some people in the Arab world believe that you can tell someone's future by reading the coffee grounds left in a cup of coffee the person drank. Most people don't believe this and it's much like tarot card or palm readings in the US. The word for this coffee cup reading is تبصير (tabseer). This word is really easy to remember since the root is بصر which means "to see". To do a cup reading is measure 2, so بصّر or تبصير. In the Arab world coffee is drunk from a small cup called a فنجان (finjan). The coffee still has grounds in it which are left over once you drink the coffee as you can see in the picture. The person reading the cup will have the person whose cup it is put their thumb print (بصمة, basmah) in the coffee grounds and then they will tell the person's future based on the patterns in the coffee grounds. There's also a part of the reading where they turn the cup upside down. I'm not sure how that plays into it all, but the word they use for "turn it upside down" is طب (tub). In the video clip below the cup reader says قوليلها طب حتى شوف لها المستور , "tell her to turn it over so I can see the hidden (meanings)". The interpreter interprets "turn it over" as "bend over". That's the joke. The video is from a Lebanese comedy show called كتير سلبي on MTV Lebanon. This is more like a Lebanese thing i guess. It is also known in Turkey..
A restaurant near where we live is owned by a Turkish chef. When you eat there during the holidays and order Turkish coffee, they gave you a sheet with instructions to turn the cup over (when finished) and the sheet included many symbols for the customer to interpret the meaning. We found it to be amazingly accurate.